The National Cathedral is a cathedral of the Episcopal Church. Its neo-gothic design is what makes the architecture so beautiful and what draws over 400,000 visitors each year! 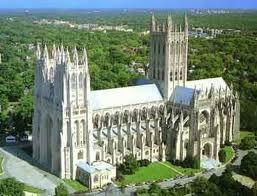 It is the sixth largest cathedral in the world, the second largest in the US, and the fourth-tallest structure in DC. The average attendance at Sunday services in 2009 was 1,667, which is the highest of all domestic parishes in the Episcopal Church! The Old Town Trolley is the only tour that takes you to the National Cathedral. It is stop number 17 on our route. Posted in Washington DC | Comments Off on Washington’s National Cathedral! Did you know that what now serves as a beautiful architectural institution of learning was once the grounds of the Ponce de Leon Hotel? 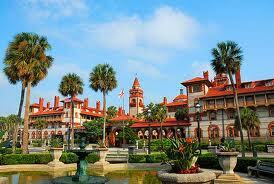 It was built in 1888 and is known for it’s beautiful settings and luxurious amenities! Now more than 2000 students attend Flagler college every year since millions of dollars have been spent renovating and restoring the historic buildings! You can hop off the trolley at Stop #13 take a stroll around this beautiful campus. Did you know that construction on the Jefferson Memorial began in 1939, the building was completed in 1943, while the bronze statue of Jefferson was added in 1947? It is ranked fourth on the List of America’s Favorite Architecture by the American Institute of Architects! 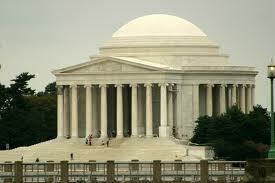 Posted in Washington DC | Comments Off on Hello, Mr. Jefferson! Did you know that Georgetown was the farthest point upstream that oceangoing boats could navigate through the Potomac River? In 1632, Henry Fleet, a fur trader, documented a Native American village of the Nacotchtank people Tohoga, which is located on present-day Georgetown. 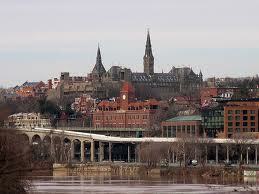 It is now a historic neighborhood, commercial, and entertainment district situated along the Potomac River! The trolley will has a stop in Georgetown, #18. You are currently browsing the Old Town Trolley Tours Blog blog archives for December, 2012.